In practical machining areas, since parametric toolpath can ensure smaller approximation error in computer-aided design/computer-aided manufacturing (CAD/CAM) systems and provide stable feedrate in computer numerical control (CNC) systems, it can improve machining efficiency and machining quality simultaneously compared to linear and circular segments. Therefore, it is necessary to improve the performance of feedrate planning and interpolating for parametric toolpath. In this paper, the parametric toolpath is re-parameterized by the displacement to analyze the feedrate, acceleration, and jerk constraints in the Frenet-Serret frame, and a novel motion method including feedrate planning and interpolating is presented. Afterwards, a time-optimal method for the parametric trajectory is proposed based on linear programming algorithm to limit the multi-constraints and obtain Bang-Bang control. 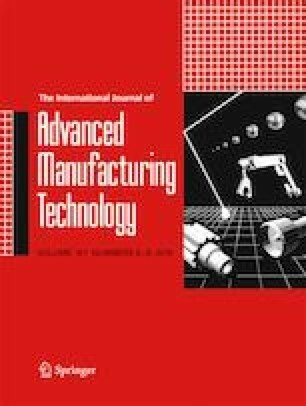 To improve machining accuracy further, a feedback interpolation method is introduced to eliminate the feedrate fluctuation. Finally, experiments are conducted to demonstrate the efficiency and contour performance of the proposed method compared to the conventional methods. The results show that the proposed method can ensure better contour performance and the cycling time is also reduced by 10.46% and 2.86% for 2D and 3D toolpath respectively. The authors are grateful to Guangdong ELESY Electric Co. Ltd. for the technical assistance in Section 4. This work was partially supported by the National Key Technology Support Program of China (No. 2015BAI0B16) and National Science and Technology Major Project of China (20181820249).